Coat skillet with EVOO and crank heat to medium-high. Mix together 2 tablespoons of flour and salt and pepper. Completely coat scallops with mixture. 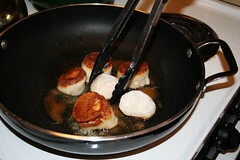 Place scallops in oil and sear for 2-3 minutes. Flip and sear for an additional 2-3 minutes. Remove from heat, place on plate, and cover with tin foil to keep warm.